At first listen, The Blackwater Fever evokes a swampy, dirty sound that conjures up the dark, mysterious American South; dense and heavy forested places you don't want to happen upon alone. Their full sound quickly creates the illusion that every band member – four, maybe five— operate on high octane. So imagine my surprise. The Blackwater Fever is Australian, not American. Band members? They're a power duo. Released on Plus One Records, In Stereo is the sophomore full-length album from the Brisbane-based band. It was recorded at Borough Studios in Brisbane, co-produced by the band, along with Skritch (Mary Trembles, Tex Perkins’ Dark Horses). Comparisons to the Black Keys and White Stripes are inevitable, but not really needed. The Blackwater Fever isn’t really like either band or anyone else. They aren't even close. They just happen to play hard with drums and guitar. The Blackwater Fever serves up rock blues and soul; but nothing traditional here. Fans of their shows will instantly recognize many of the songs included on In Stereo because The Blackwater Fever has been playing them live for some time. They only recently got down to the task of capturing them on disc. These are “old” songs most of the world is hearing for the first time. Atmospheric blues rock sounds about right. The band says In Stereo is not nearly as dark as their first release, the solid Sweet Misery. In Stereo is lighthearted in a way, but not by any means light. There isn’t a weak track on the album, but two stand out more than any other. Sophia’s Waltz spins a bittersweet, sad tale that sticks in your head. Better Off Dead is an atmospheric tune commissioned for the Australian horror film called The Tunnel. Here's a taste from an older live session. 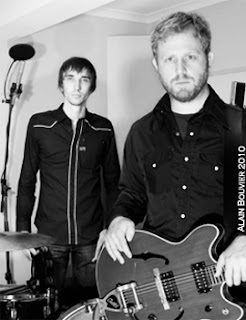 In Stereo is even better, thanks to singer/guitarist Shane Hicks and drummer Andrew Walter. The duo works because Hicks’ husky tones and remarkable guitar work brings the songs to life while Walter's purposeful drumming weaves it all together. How the duo became a trio at the last minute of recording. Oddly, the duo became a trio with the addition of keyboardist/organist/bassist Jed Walters when In Stereo was nearly complete. The band had been looking for a third member for quite some time and had all but given up hope. They wanted a perfect fit. In Stereo doesn't include anything with their new member, but anyone seeing them live knows. With Walters on board, The Blackwater Fever is bound to cut a third album sooner rather than later. Expect the keyboardist to play a prominent role. This past summer, millions of Americans were exposed to the band (although they may not have known it) when slivers of their songs were featured by HBO in a short-term Cinemax marketing campaign, including one promoting Terminator Salvation. Maybe 2012 will be the year they know where it came from. The Blackwater Fever’s In Stereo Slithers In 9.0 on the Liquid Hip Richter Scale. The band will be playing several dates in their native Australia in early December. I'm already hoping to see them include North America among their tour dates; 2012 would be a fine year to have it happen. In Stereo by The Blackwater Fever is on iTunes. You can also find In Stereo at Amazon. If you sign up to their email list, you can receive a free MP3 of Back Roads from the album.